I decided a week or so ago that I really wanted to brew some iced tea from my current tea stores so I have a cool refreshing treat this summer. Ideally, I’d like to brew a whole pitcher that I can keep chilled in the fridge and drink from over the course of a few days. However, I was a little confused about whether I needed to brew the tea hot and then ice it or if it could be done entirely with cold brewing. So now you get the results of my research! 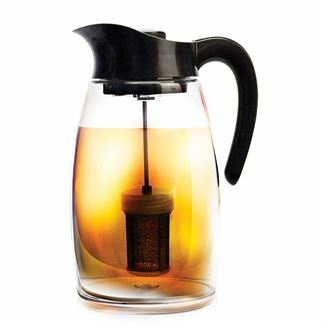 Aside from the reasonable price point, I really liked that this pitcher is heat resistant and comes with an insert so you can brew loose leaf tea right in the pitcher. It also comes with an insert that allows you to freeze an ice core and chill the tea, as well as one that would allow you to infuse your tea with fresh fruit. It’s also BPA free and dishwasher safe. What more could I want? I’m going to order the pitcher this week and I’ll let you know what I think. Now for the tea. It seems like everything I read encourages hot brewing a small amount of strong tea and then diluting it and chilling it at the same time. For instance, one recipe suggested that you heat 1-3 cups of water to the correct temperature (for me that would be “HOT”) and then use 7-10 teaspoons of your loose leaf tea. This will make a super strong brew, which you can then dilute and chill by filling the rest of the pitcher with ice, or cold water. Several sites suggested that the cooling process should be done immediately, as it keeps the flavor and the scent of the tea more true. I also found that most suggested adding sugar during the hot process, both to enhance the sweetness of the tea and for ease of dissolving the sugar into the hot water. The final note was that when you’re brewing large quantities of tea, you can feel free to mix and match different teas to create your own unique flavors. I keep thinking about which teas of mine I should combine. I’ve also been giving some thought to making my more expensive teas last a little longer, but combining them with slightly less expensive teas. The possibilities are sort of endless? I’ve been toying with the idea of one of those infuser pitchers! I will be super excited for your results and input once you receive yours!! It arrived this weekend – I’ll update soon!